There are strong indications that the Presidency may be declaring a State of Emergency in Abia State following the security reports which the security agencies in Abia State sent to the office of the President this morning over the mayhem unleashed on innocent citizens by Thugs sponsored by the Abia PDP. At the early hours of Saturday, thousands of Youths barricaded major roads in Aba including the ever busy Porharcourt Road, destroying goods and properties over the outcome of the Appeal Court verdict which ordered immediate swearing in of Alex Otti as the duely elected Governor of Abia State. Okezie Ikpeazu had after hearing the news of the Judgement said he will be proceeding to the Supreme Court to challenge the Decision of Justice Oyebisi Omoleye led five-member Appeal court panel which declared him an illegal Governor. PUO learnt exclusively yesterday that the governor and his Team of lawyers were unable to get the Certified True Copies Of the Judgement. A security personnel who spoke to PUO on phone from Aba said the sacked Abia Governor has taken a very dangerous step by sponsoring thugs to unleash mayhem on innocent civilians in Aba at a time when the military is battling with Biafra protesters. 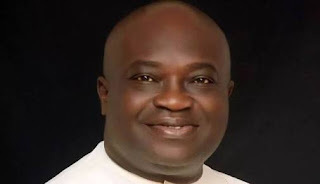 According to him, the Governor may likely not have the opportunity to Appeal the Judgement should Information at the disposal of the security agencies in Abia State comes to fruition.